Frank J. Phillips currently serves as a Stony Point Town Justice. He is a former assistant district attorney and town attorney. 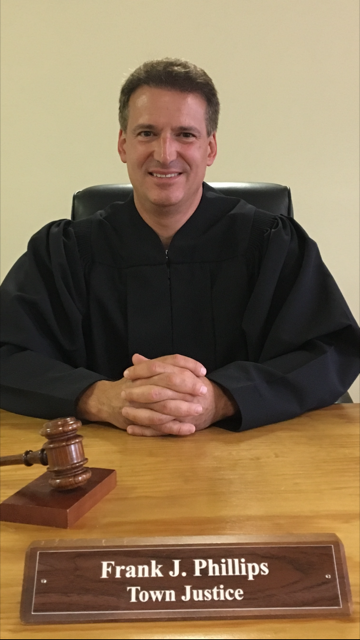 Judge Phillips is the only Stony Point town attorney ever to argue and win a landmark case in New York’s highest court. He has written more than 80 local laws and a town code. He maintains a private law practice when not on the bench. He is admitted to the bar in New York and Connecticut as well as the U.S. District Courts for the Southern and Eastern Districts of New York. Community Service: Founder of Phillips Tee-Off for Tots Foundation to benefit children with life-threatening illnesses; North Rockland Rotary Club; Stony Point Lions Club; 2002 Forty Under Forty Rockland County Businesspersons; 1997 Leadership Rockland graduate.